The Pink Pearl is perhaps the most well known eraser on this list. I am sure all of us have fond memories of using this rubbery pink parallelogram during math classes. We also probably remember how gritty it was and how it left horrible tears or pink smudges on the paper. Well, this is not your 80's Pink Pearl. I will readily admit that I expected that Pink Pearl of yesteryear; gritty, barely usable, and endlessly frustrating. Papermate has a tendency to take good products and butcher them and the Pink Pearl-- I figured-- was no exception. Boy was I surprised when I used the Pink Pearl for the first time in 25 years. No grit, no smear; just buttery smooth effectiveness. The Pink Pearl performed well beyond my expectations and has become my new favorite EDC eraser. There is something about the nostalgia of carrying a Pink Pearl with me everywhere. I like it. The Radar came recommended from one of my favorite Erasables, Less (check out their page!). It comes in a variety of subtle colors, but I gravitated towards blue. I am kinda bummed the eraser itself is not quite blue enough, but where it lacks in vibrancy, it make up in performance. Not only does this plastic eraser remove most traces of graphite, but its dust rolls up nicely into little bunches for easy clean up. The Radar has a useful cardboard sheath that prevents the eraser from breaking. I am a huge fan of Tombow products. 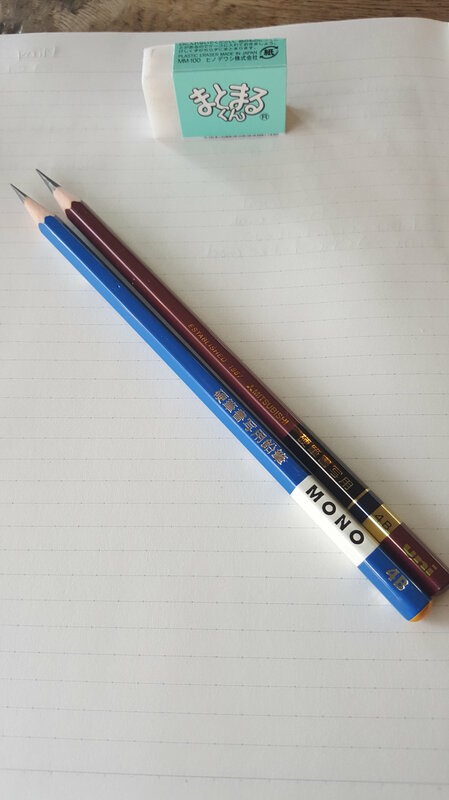 I have a current affair with their Brush Pens and the MONO 100 was my favorite pencil before I found the Erasable Podcast group. 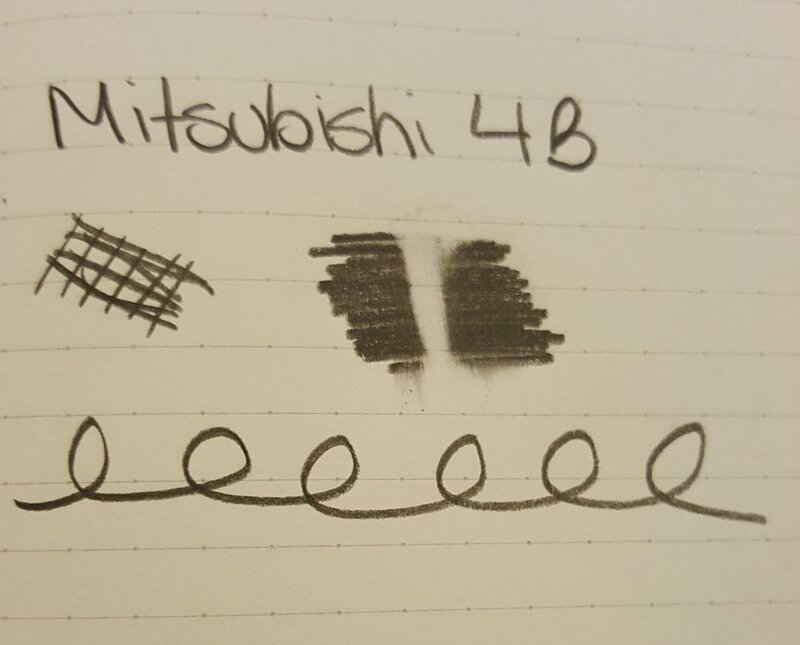 I expect nothing but the best from Tombow and while the eraser does a good job with line drawing and regular handwriting, it struggled with the shading portion of the test. At first, it smeared a bit and then managed to get the job done. Like most plastic erasers, the dust clumps neatly together and does not leave a mess. The MONO is affordable and worth giving a shot. I expected a lot from the Technik for two reasons: its price and the fact that it is made by Caran D'Ache. I was most let down by the eraser's ability to erase cleanly. It performed OK with line drawings, but with the shading it had excessive smearing and took a lot of effort to get the most graphite cleared. The Technik is a very hard eraser and it leaves neat rolls of eraser dust. I posit that the hardness of the plastic has to do with its crummy erasing performance. I know I said I wouldn't review erasers here, but I can't resist with this one. I'd pass on purchasing and instead get 3 Pink Pearls (or really 3 of anything). The Pentel Ain erases well, but is a bit dusty. It showed some smearing on the shading part of the erasing test, but with some effort it came through and got the job done. Not much to say here, because it was solidly mediocre. The Magic is an eraser that I have been wanting to get my hands on for some time. 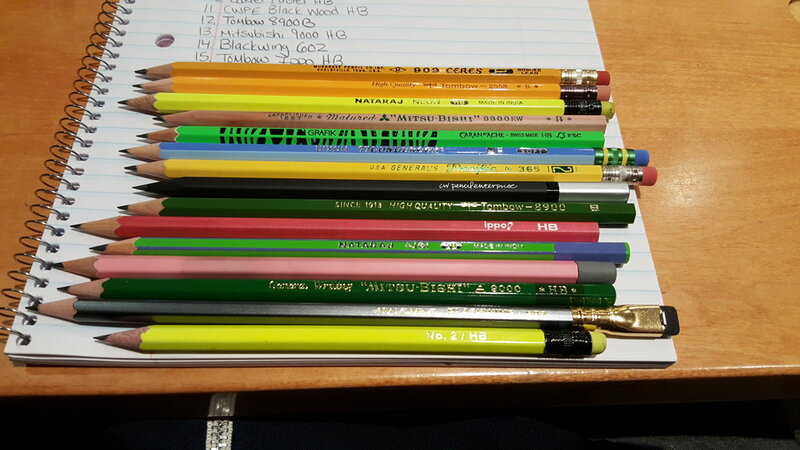 I love how each eraser is different with varying colors and swirls. As a rubber eraser, the Magic is clearly very dusty. I'd liken the dustiness to a standard pink pencil eraser (think Ticonderoga/General's). It has a nice pungent rubbery smell and does fantastically on regular light handwriting and lines. It is a smeary mess on the darker lines and shading parts and actually reminds me of the Pink Pearl from years ago. The Magic is a cool eraser nonetheless and is a nice pocket carry, but at $2.50 you are definitely paying for the novelty. I was quite unimpressed by the Mars plastic; it was dusty, took a lot of effort to erase things, and smeared a heck of a lot. 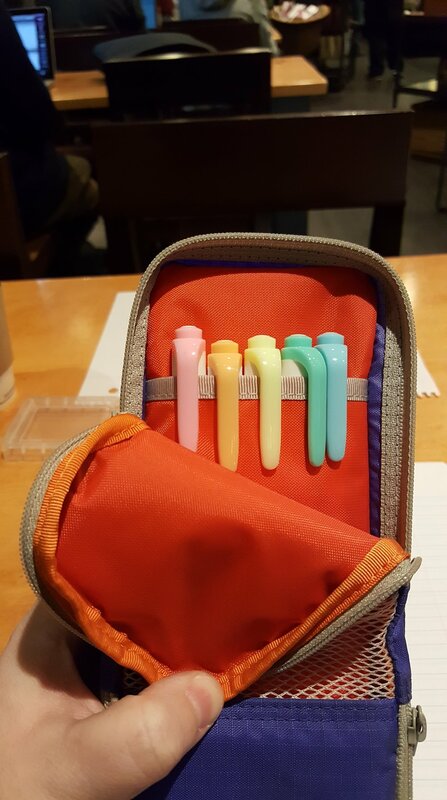 I expected more from Staedtler, but was left with a less than average eraser. I do like the size of the Mars as it makes for easy erasing, but the effort you put forth getting the job done negates the bonus of a larger eraser. The Hinodewashi came highly recommended from pretty much anyone that has used it, so I was excited to use this delightfully bright white block of plastic. It performed beautifully with very little effort. The dust rolled up nicely and did not smear any of what was erased. These are hard to come by in the US, but Caroline has a few at CW Pencil Enterprise if you are interested. 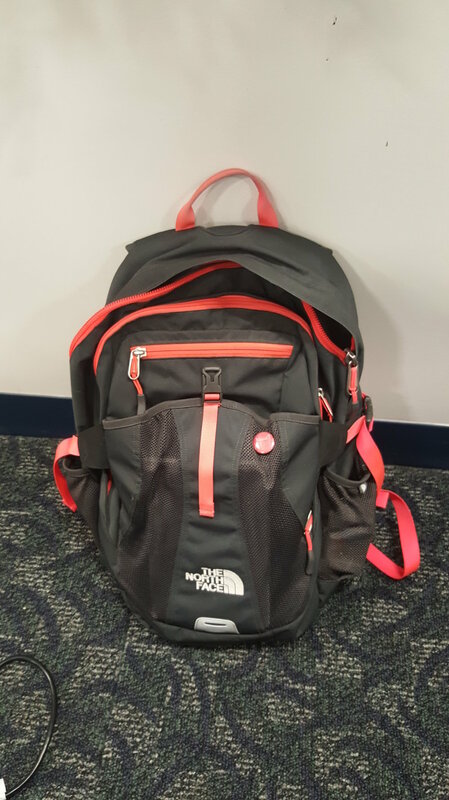 The minimalist design of CDT products always draw me in. I enjoy a product that lets its product do all the talking and not the packaging. Well, the CDT left a lot to be desired. First, when opening the eraser I could not help but notice the smell. I can't even tell you what it smelled like, but it was a chemical-like smell with a hint of plastic. In fact, it was so pungent I could smell it without putting it up to my nose. Once I got past the smell, the CDT was meh. Yes, it erases, but is dustier than I had expected and it took a lot of effort to erase the samples and even then, you can see a shadow of what was once there. I want to start off by saying this eraser was my absolute favorite design wise. 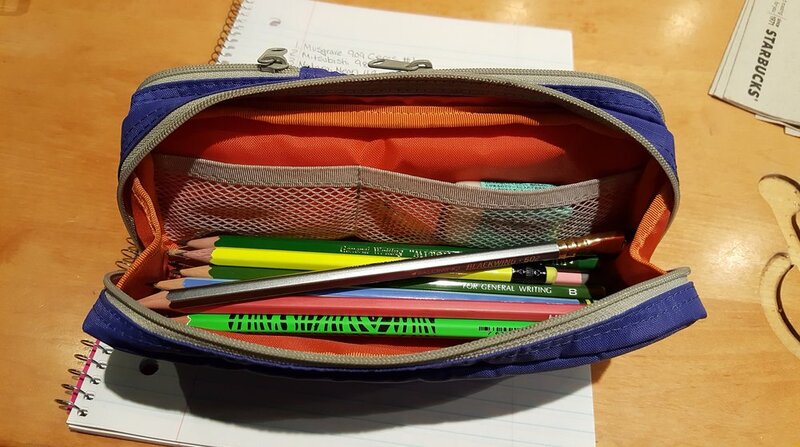 I love the hexagonal shape (which I believe is a nod to the pencil) and the recessed center that allows for a very comfortable grip. The six corners allow for maximum control and precision. The Thermoplastic erases OK, but does leave a shadow on both samples. I would say that this eraser is best for light writers out there that do not press that hard or use H grade graphite. I know this eraser says its plastic, but it was the dustiest of the plastic erasers I have tested. 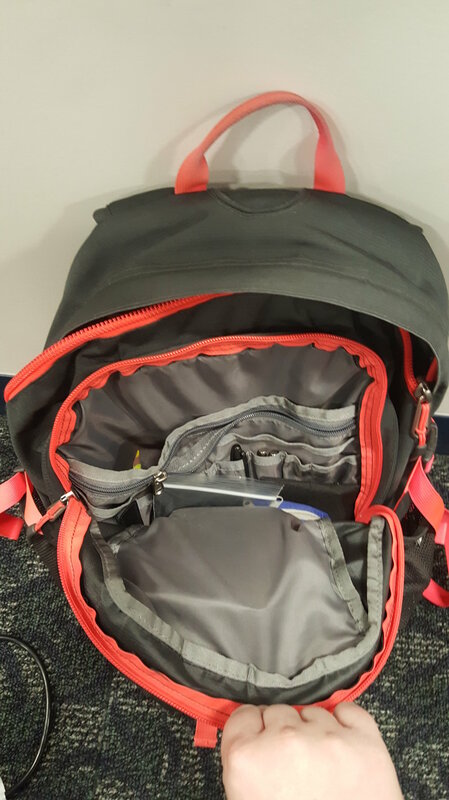 The Thermoplastic comes in a myriad of colors and if not used as an every day eraser, its still a cool pocket carry (its almost reminiscent of those worry stones one would carry in their pocket). Another recommendation from Less, the FC Dust Free never ceased to amaze me as I explored its qualities. First, I love the dark green color-- it does a good job of hiding any graphite marks that may transfer to the eraser. Second, while subtle, is the contoured edges that make for comfortable holding. I really didn't think that this would make a difference, but it did and has a really good hand feel when erasing bigger projects. Finally, it lives up to its name: Dust Free. This eraser was perhaps the most effective when keeping its waste materials rolled up in tiny little bunches. The FC Dust Free also erases beautifully. Not the top performer in the "clean erase" field, but it definitely holds its own. 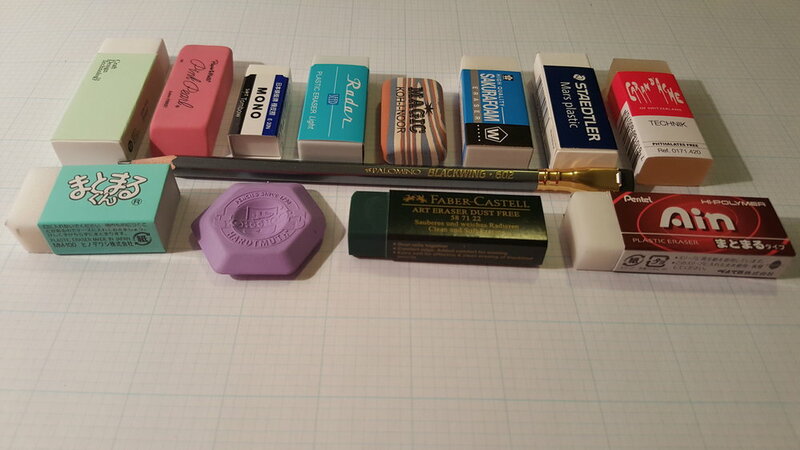 The Sakura Foam is one of the few erasers on this list that I have used before. I really like the way its shavings ball up together-- this makes for a quick and easy cleanup. The Sakura does an amazing job erasing any kind of line drawing or handwriting. Where its lacks is its ability to erase large areas of shading. I'm not an artist, so this is not a deal breaker for me, but something to keep in mind. Another downfall of this eraser is that it wears down pretty quickly. That worn down edge you see in the picture is just from the two tests I did (line drawing, sentence erasing, and shading). The Sakura definitely lives up to its "High Quality" designation, but if you make a lot of mistakes, you will blow through these pretty quickly. With that being said, it continues to be one of my favorites for every day erasing. 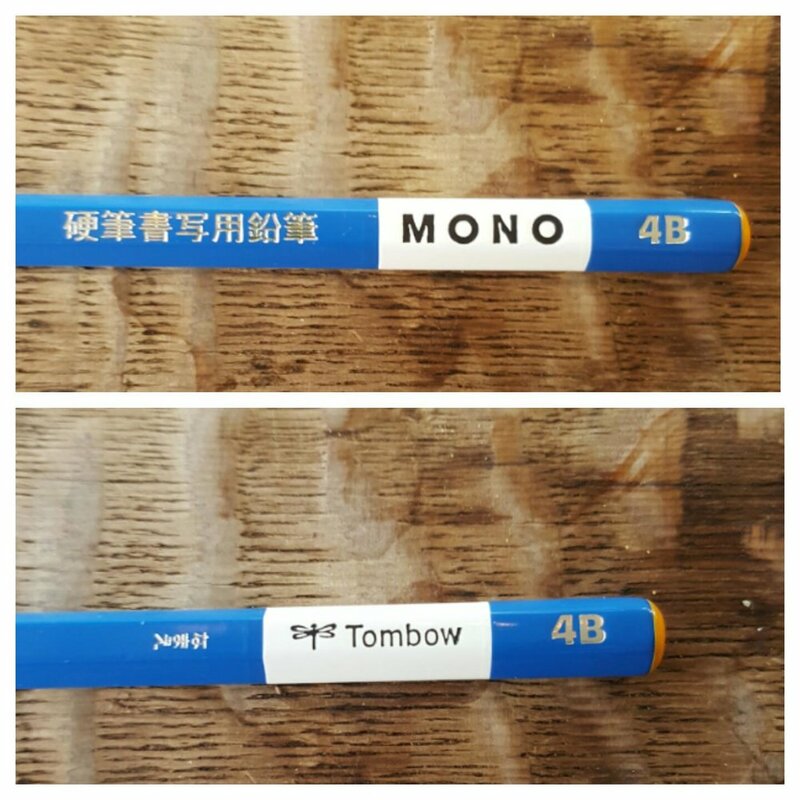 The Tombow 2558 has been a pleasure to write with this week. Smooth, dark graphite for an HB graded pencil, a nice color coordinated look, and pretty decent graphite durability. I didn't really expect much from an regular old school pencil, but as always Tombow never fails to disappoint. I found myself entrenched with statistics notes this week and the Tombow came through. My only complaints were that the graphite, because it was soft, wore down pretty quickly and I required a bit more sharpening than I would have liked. The eraser on the pencil wore down pretty quickly and left a lot of crumbly shavings, but I did like the nice touch of matching the ferrule with the foil stamping on the pencil. 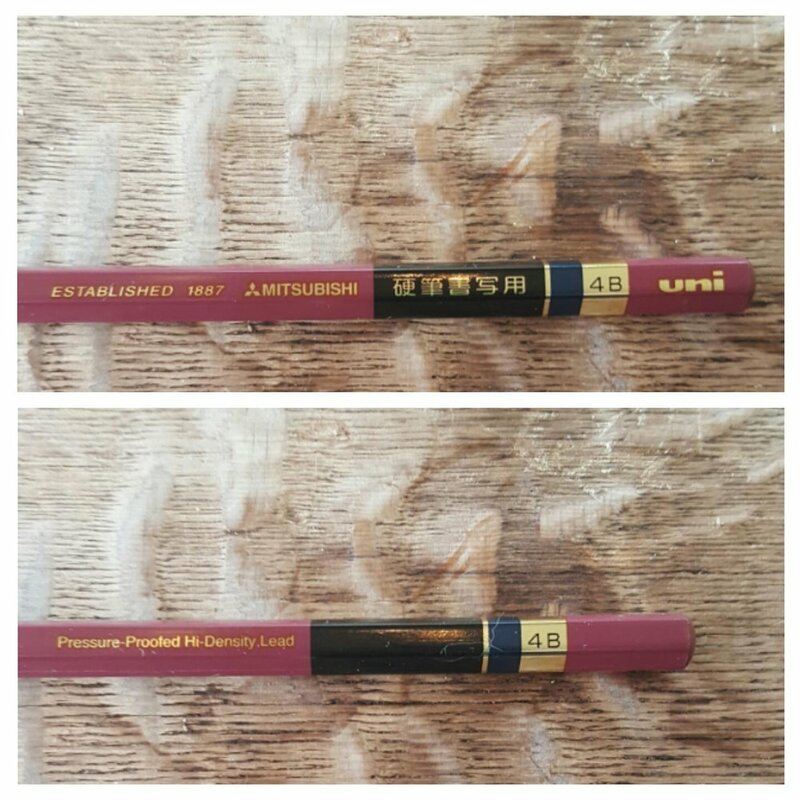 I gave this pencil such a high rating because even though it wore down pretty quickly, I could see myself ordering a gross of this pencil and using it every day. Head over to JetPens if you are interested in picking up a few!